SeaWorld is a soulless corporation that mistreats and abuses its animals and has been responsible for the death of one trainer and injuries to others. SeaWorld would like to frame this debate in a way that portrays supporters of "Blackfish" and opponents of SeaWorld as hateful bullies. However that's a pretty tough call for a dolphin prison to sell. The more they attack "Blackfish" the more guilty they appear to the public. They are desperate and they know their ship is sinking rapidly. As any good student of strategy will tell you, the best way to deal with a powerful opponent is to use deception and distraction. We can't let SeaWorld distract us from their sins. Remember Dawn Brancheau? She's dead. SeaWorld killed her through incompetence and recklessness. Her death alone is sufficient reason to shut down SeaWorld. In response, SeaWorld is attempting to demonize people who care for the dolphins and the welfare of the trainers. It's difficult to frame your opponents as heartless haters when you have a human death on your hands and a reputation for gross mistreatment of animals and when you reduce a beautiful powerful intelligent creature like Tilikum to being a stud sperm donor to be manually masturbated by humans for the purpose of breeding more slaves for the entertainment of gawking humans. You change the focus, and you change that focus by distracting the public to direct their hatred at a 15-year-old girl who simply is trying to build an international wildlife education program. SeaWorld now can say, "look at these people, they are sending death threats and hate messages to a young girl who wants to save wildlife. We told you they were angry radical haters and this proves it." We cannot let SeaWorld frame this to suit their agenda. Keep the focus on SeaWorld, folks. That is where your anger should be directed. It is not constructive to alienate Bindi Irwin's support base and she does have a large support base. SeaWorld is the villain here. Not Bindi Irwin. On the positive side this controversy is serving to keep the opposition to SeaWorld before the public but we must never lose sight of the fact that conservationist, animal welfare and animal rights people are compassionate people. We are not bullies. We are not haters. And we should not let SeaWorld frame their opposition as such. Is the objective to vilify Bindi Irwin or to shut down SeaWorld? Yesterday, the mayor of San Diego announced that SeaWorld is important to the San Diego economy and that this California bill to ban performances by marine mammals will hurt San Diego's economy if it passes. It could also be said that Dachau was important to the economy of Munich. It can be argued that slavery was important to the economy of the South. There can never be any economic justification for slavery or animal abuse. Bullfighting was a big part of the economy of Catalonia, Spain, yet they have banned this sadistic sport because it is unethical and has no place in the 21st Century. Forcing highly intelligent, socially complex, self-aware sentient beings to perform tricks for humans in a coliseum atmosphere has no place in the 21st century either. Remember this is about abuse and irresponsibility. It is about the death of a trainer and the captivity and suffering of intelligent beings. Sea Shepherd Conservation Society is dedicated to closing the doors to SeaWorld. We are dedicated to ending the captivity of marine mammals. We are dedicated to ending the ruthless slaughter of dolphins by the captivity industry. We are dedicated to replacing these circus facilities that exploit dolphins with educational facilities that tell the public exactly what is happening in our oceans, especially the diminishment of bio-diversity. We will not be distracted. We know who our enemy is. That enemy is the mentality that treats animals as objects of entertainment and abuses them for profit. That is why Sea Shepherd ships are in the Southern Ocean dramatically reducing the number of whales killed. That is why the Cove Guardians have just spent six months on the ground in Taiji, Japan to focus world attention on the slaughter of dolphins. That is why Sea Shepherd is preparing a campaign to oppose the killing of dolphins in the Faeroe Islands this summer. That is our focus - direct intervention and the saving the lives of whales and dolphins. The movie "Blackfish" has regenerated the movement to end the perversion of Orca captivity. We intend to help keep this movement moving and growing. We will not be distracted by the manipulations of SeaWorld and their attempts to demonize compassion. We know who the enemy is, and we will continue to fight that enemy with all the passion of our thousands of volunteers around the world. 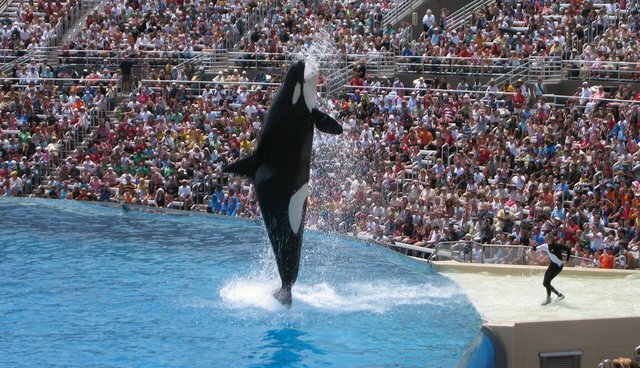 SeaWorld is not framing this controversy. Sea Shepherd, Oceanic Preservation Society, Save Japan's Dolphins, Earth Island Institute, The Dolphin Project, HSUS, and many other organizations and tens of thousands of caring people around the world. These organizations and people are all part of a movement and that movement is a tsunami battering relentlessly against the walls of SeaWorld and other dolphin prisons. These walls will fall. The tanks will be emptied. Because SeaWorld only has money and influence but this movement has passion, imagination, courage, resourcefulness and resolve. And these incredible virtues will continue to penetrate the dark cloud that hangs over Orlando, San Diego and other places that host these prisons of pain. And once that odorous cloud is dissipated, the sunshine of freedom will empty those torturous tanks forever.